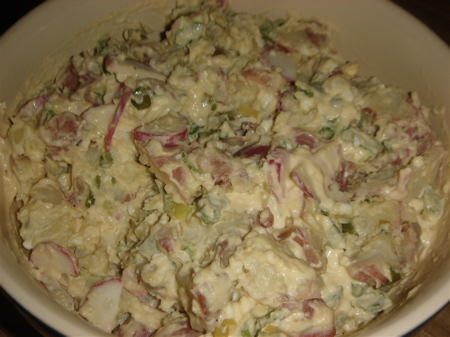 Everyone has their favorite Potato Salad recipe. Mine combines fork-tender potatoes, a tart marinade and then a creamy mustard dressing enriched by chopped hard-boiled eggs. Mix that up with the cooling crunch of celery and radishes and call it one of the best versions you'll ever put between your lips. Cook potatoes until done. Drain and let cool for 20 minutes while making the marinade. Whisk together olive oil, cider vinegar and the rest of the marinade ingredients. Pour over warm potatoes. Let sit for a half-hour. Combine dressing ingredients. Toss with potatoes. Add celery and radishes and toss gently. Refrigerate for at least 4 hours or, if possible, overnight before serving.